BS EN 1997-1:2004+A1:2013, Section 7, and Clause 4 and Clause 6 (this clause) of this standard. NOTE Information about different types of bearing piles can be found in the ICE manual of geotechnical engineering (2012), Volume II, Chapter 81 . 6.1.1.2 Piles may be classified according to the ground disturbance caused by their installation, as shown in Table 7. A) BS EN 1997-1 provides partial factors for driven, CFA, and bored piles only. B) The words «high» and «low» here refer to the degree of disturbance of the ground during installation. C) May be classified as large displacement in dense, coarse soils or stiff, fine soils. D) If these piles plug, then they should be re-classified as large displacement piles. Bored cast-in-place concrete piles may be constructed in supported or unsupported borings that are created by rotary drilling or continuous flight auger (CFA) equipment. Driven cast-in-place concrete piles may be constructed with or without permanent casing. 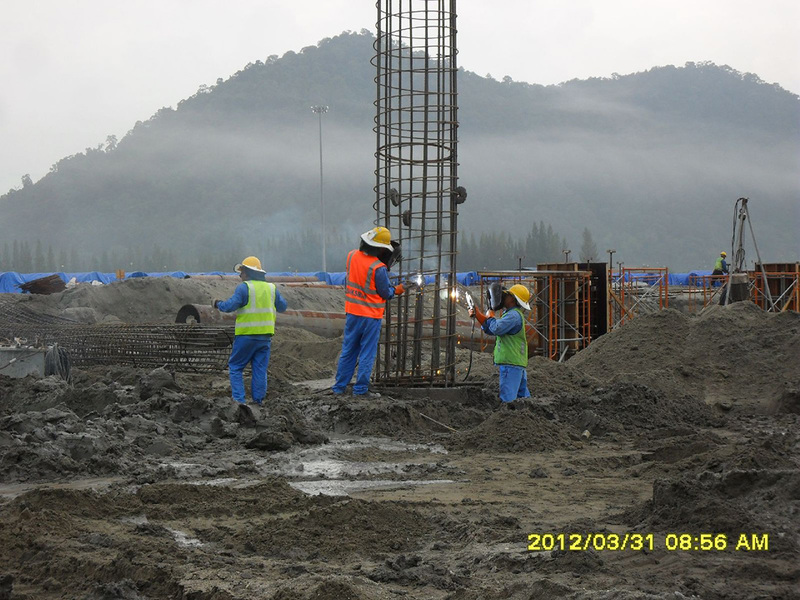 Prefabricated concrete piles are also commonly termed «precast concrete piles». Precast concrete piles may be reinforced or prestressed. 6.1.4.1.1 Precast concrete piles should be manufactured in accordance with BS EN 12794.
circular section with a hollow core. 6.1.4.1.3 The cross-section of a precast concrete pile may be constant or tapered over all or part of its length. 6.1.4.1.4 Precast concrete piles may be manufactured in single lengths or in segments connected with cast-in joints. 6.1.4.1.5 Precast concrete piles should be manufactured using normal weight concrete conforming to BS EN 206. Helical steel piles (also known as «screw piles») should conform to Annex A. NOTE Guidance on the design and installation of timber piling can be found in BRE Digest 479 . Although there is an execution standard (BS EN 14199), there is currently no detailed UK specification for micro piles. Project-specific specifications – based on the principles set out in SPERW [N3], but adapted for the particulars of micro piles – are commonly used as a substitute. Micro piles should be manufactured in accordance with BS EN 14199. NOTE 1 See Guide to drafting a specification for micropiles . NOTE 2 The website of the International Society for Micropiles  lists 50 papers on micro piles (but does not provide a standard specification). NOTE 3 See Guidelines on safe and efficient underpinning and mini piling operations . NOTE Guidance on underpinning can be found in the ICE manual of geotechnical engineering (2012), Volume II, Chapter 83 . Pile groups are often used when the bearing resistance of individual piles is insufficient to carry load from the structure. Although pile groups provide greater bearing resistance, they might do so less efficiently than indivudal piles, leading to greater settlement during service owing to interaction between the piles in the group. Group effects may be ignored when there are fewer than five piles in the group and the piles are spaced no closer than three times their diameter centre-to-centre. NOTE Guidance on pile-group design can be found in the ICE manual of geotechnical engineering (2012), Volume II, Chapter 55 .
for displacement piles, BS EN 12699. 6.2.2 Pile foundations should be classified as Geotechnical Category 2 or higher, as defined in BS EN 1997-1:2004+A1:2013, 2.1.
potential for lateral soil movements adjacent to excavation and fill areas in the vicinity of piles. 6.3.1.2 The design of a pile foundation should be modified as necessary to account for any significant variation from the expected pile behaviour during pile driving or from expected ground conditions during boring for cast-in-place piles. BS EN 14199 for micro piles. The resistance of individual piles is reduced in the vicinity of other piles. It is common to limit this reduction in resistance by specifying a minimum spacing between the piles. The relevant spacing differs for «friction piles», which derive the majority of their bearing resistance from their shafts, and for «end-bearing piles», which derive the majority of their bearing resistance from their bases. D is the outside diameter of the larger of two adjacent piles. 6.3.3.2 Closer pile spacings may be used if it can be shown that any increased settlement of the piles arising from their interaction does not lead to a limit state being exceeded. 6.3.3.3 Closer pile spacings may be used when the piles form part of an earth retaining structure. 6.3.3.4 The choice of pile spacing should take into account the pile installation method, particularly when dealing with driven piles.